Carte de isle Britanniques comprenant l'Angleterre l'Ecosse et l'Irlande. 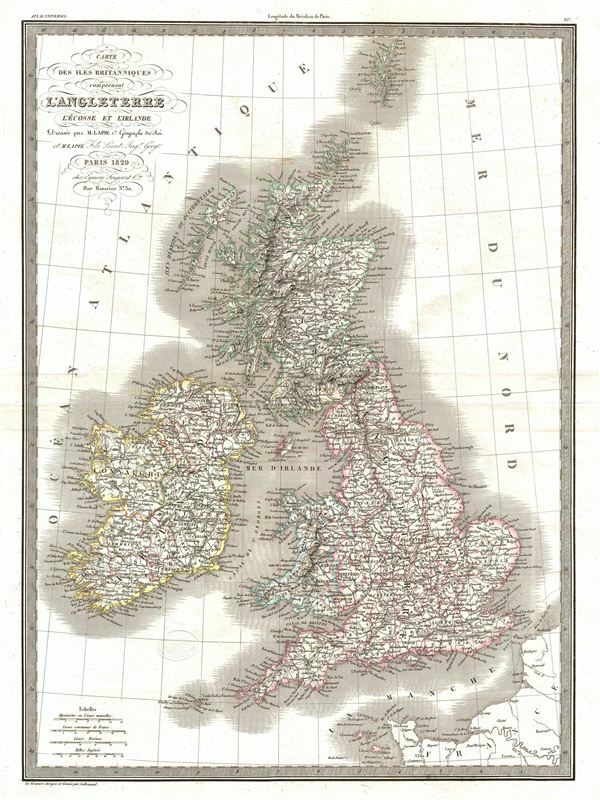 A fine first edition example of M. Lapie's 1829 map of the British Isles, including england, Scotland and Ireland. The Map covers the countries of the United Kingdom from the Shetland Islands to France and shows Ireland, Scotland, england, Wales and the Hebrides. At this time in history, the Kingdom of Great Britain and the Kingdom of Ireland had already been formed into a single political entity. Britain, trying to preserve the declining Ottoman empire, intervened in the Crimean War with some success. This map was engraved by Armand Joseph Lallemand as plate no. 25 in the first edition of M. Lapie's important Atlas Universel. This map, like all maps from the Atlas Universel features an embossed stamp from the Lapie firm. Rumsey 2174.025. Phillips (Atlases) 754, 765.